Grasshoppers (Caelifera) are members of the class Insecta and classified under the order Orthoptera, which also contains locusts, katydids and crickets. There are more than 11,000 known species of grasshoppers inhabiting every continent on Earth except Antarctica. Fortunately for these powerful little hoppers, they are not picky eaters and can find sustenance wherever they live. Grasshoppers are medium to large insects, ranging from 1 to 5 inches in length. They're distinguished by their ability to jump astounding distances and heights. Like other members of Orthoptera, they have two pairs of wings, two antennae, long hind legs and chewing mouth parts called mandibles. They have large eyes and are typically camouflage-colored in green, brown or gray, enabling them to blend into their environments. Females are larger than males and have sharp points on the ends of their abdomens to lay eggs underground. Many males possess structures on their wings that they rub to make noise. Unlike some of their Orthoptera counterparts, grasshoppers don't prey on other insects. Although they may nibble on dead animal matter for protein, they're primarily herbivores. Easy to please and highly adaptable, these opportunistic little diners will eat whatever plants or vegetables are available. The enzymes in their saliva and stomachs enable them to digest even the driest plant matter. They're particularly fond of cotton, clover, oats, wheat, corn, alfalfa, rye and barley, but will also consume grasses, weeds, shrubbery, leaves, bark, flowers and seeds. 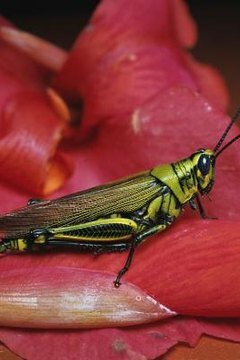 Some grasshoppers eat toxic plants and store the toxins in their bodies to discourage predators. Newborn grasshoppers, or nymphs, emerge from their eggs and metamorphose through several stages before reaching adulthood. Nymphs look like compact, bright green versions of adult grasshoppers. However, they're unable to move very far, their mandibles aren't strong and they're too fragile to digest the tough plants enjoyed by adults. Nymphs consume easily digested plants like shoots, grasses or clover. As they age, they molt several times, growing bigger each time. Their mandibles grow larger and stronger. With each molt, they're able to consume more and more of the same foods eaten by adults, until they reach adulthood and are able to enjoy the whole buffet. Due to their relatively undiscerning appetites, grasshoppers can become a nuisance. You may find the little diners munching away in your flower or vegetable garden. They can be particularly bothersome to farmers, who find that grasshoppers are especially fond of their expansive crop fields. In Africa, swarms of grasshoppers have been known to destroy entire fields of crops. Grasshoppers are an important, stable food source for many animals. Common predators include birds, reptiles, rodents, spiders, beetles, mantises and other insects. Flies feast on grasshopper eggs. Even some human beings eat grasshoppers. Grasshoppers and other insects are a traditional food and natural protein source in African, Asian and Latin American countries. Some daring foodies in the U.S. and Europe consider chocolate-covered grasshoppers a delicacy. Discovery Magazine: What Do Grasshoppers Eat?